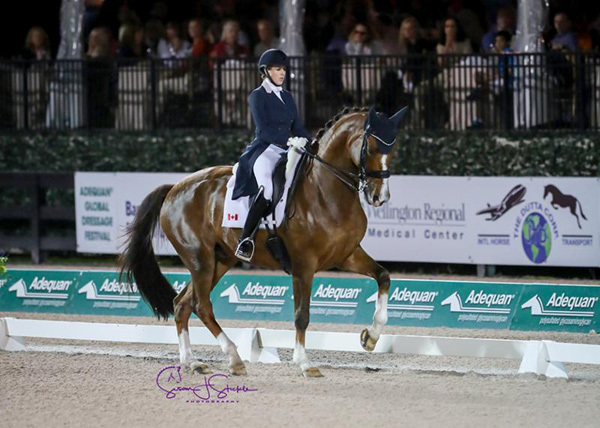 by: Alice Collins for Jennifer Wood Media, Inc.
On Diane Fellows’ rising superstar mare Havanna 145, Ashley Holzer (USA) recorded back-to-back wins in week seven of the 2018 Adequan® Global Dressage Festival (AGDF) at Palm Beach International Equestrian Center (PBIEC) in Wellington, Florida. They won the Grand Prix Freestyle CDIW, presented by NetJets, under the lights with an impressive 78.2%, with two judges — the British judge Stephen Clarke and the judge from Luxembourg, Christoph Umbach — awarding the pair over 79%. The freestyle highlighted AGDF week seven, which continues through Sunday, February 25. Holzer’s student, Canada’s Brittany Fraser, finished second on All In, with local rider Shelly Francis and Doktor slotting into third. The class was dogged by increasingly heavy rain, with last-drawn Holzer bearing the brunt of the weather. Holzer, who found her music by googling “emotional uplifting music” which Tamara Williamson then crafted to fit the floorplan, continued: “The best thing about tonight was that Havanna came out after a strong performance last night and she again tried her hardest. Thomas [Baur, AGDF director of sport] saw her a year ago and told me she’d do it — and he was right. She’s a good egg and she tries her hardest; every time I ask her to try harder, she says, ‘OK’. It’s testament to her incredible upbringing and character. Fraser rode her own and Marc-Andre Beaulieu’s 13-year-old All In to 75.85% — their highest ever score at the level. Fraser has had the Tango gelding since he was five, climbing the ranks together, and they have been competing at grand prix for three years. It’s becoming an extremely familiar sight: Heather Blitz (USA) and Praestemarkens Quatero spearheading the small tour prize-giving, sporting the winner’s rug. And so it was, again, in the Intermediate I CDI3*, presented by Wellington Regional Medical Center, as they led the class of 16 starters, scoring 70.784%. A mistake and an unscheduled flying change coming out of the first pirouette couldn’t knock them off the top spot, so accurate, powerful and consistent was the rest of the test. This victory takes their tally to 10 wins from 11 FEI starts for the nine-year-old Quaterback x Rohdiamant gelding. As per the Prix St Georges (PSG) the previous day, Canada’s Diane Creech gave Blitz the closest run, finishing just 0.19% in arrears on Louise Leatherdale’s 15-year-old Rubin Royal gelding, Robbie W. Melissa Taylor (USA) rose from 10th in the PSG to finish third on Ansgar, Nicole Polaski’s 13-year-old gelding by Special D. All will now progress to the intermediate I freestyle on Sunday morning.